Okay, now hold on, how are you gonna ban someone from a section of your campus, only to hire them later? In what reality, in what galaxy, on what PLANET is that logical? 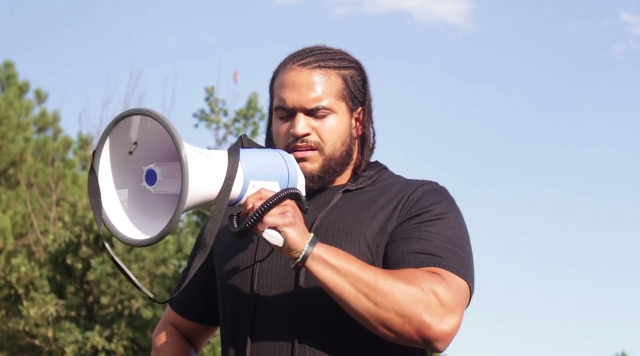 This “Black Lives Matter leader” was banned from a University of Kansas building after verbally accosting the Dean of Students in a profanity-laced tirade. During his vulgar rant, Caleb Stephens demanded that the dean, Paul Smokowski, “write a letter” that he would dictate. Of course, that never happened and he was no longer allowed to be in the School of Social Welfare building, Twente Hall. But apparently this didn’t stop the school from deciding to hire him as a graduate teaching assistant in the theater building. The amazing part is that while he is employed by the college, the ban is still in place! How crazy is that? The 2015 letter banning him from the area was sent by Vice Provost for Administration and Finance Diane Goddard and in it she detailed the erratic and frightening behavior that Caleb exhibited. Strange, right? But it gets even better. That is the kind of person you want to put in a position of authority over other students, including and perhaps especially white students? If I were going to that college, I’d be a little more than a little concerned about my safety in that class. The man is clearly unbalanced and shouldn’t be allowed on any part of the campus, let alone as a graduate teaching assistant. If you are in this school or have children who attend classes here, I would encourage you to write a letter to the school. This man is extremely problematic.